Wednesday January 30, 2019 - Detectives from the Directorate of Criminal Investigations (DCI) today stormed the National Transport and Safety Authority (NTSA) and arrested several officers in connection to the 14 Riverside terror attack a fortnight ago. This is after it was revealed that the car that was used by the attackers to access the Dusit D2 complex had similar number plates with another vehicle. The second vehicle, also a Toyota Ractis, was impounded by police in Kitengela, Kajiado County; a day after the attack. 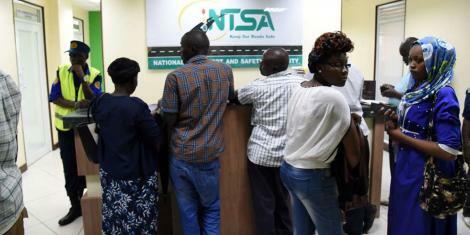 Members of the public who were seeking services at the NTSA headquarters were turned away by the mean-looking detectives who were on a mission. The DCI officers sealed off the building, asking members of the public to come back later after they were done with their investigations. The officers now want to unearth the NTSA officials who could have been involved in the registration mix-up.